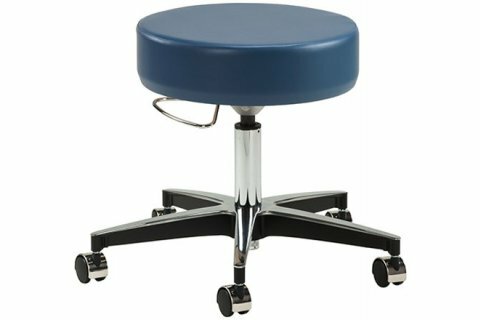 Medical Doctor Exam Stools help physicians and nurses stay comfortable while treating patients so they can offer the best care possible. 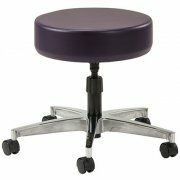 These medical stools feature comfy cushioning and easy maneuvering, for a smooth, pleasant experience. The full-size seat with thick foam padding promotes comfort. Getting into position is as easy as simply gliding to the destination on smooth, dual-wheel casters. 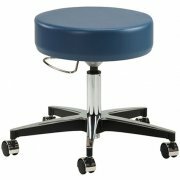 Having cushy seating and easy positioning helps doctors stay alert and positive throughout exams and procedures. 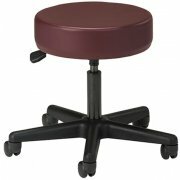 These doctor stools are designed for the healthy conditions required by medical facilities. Knit-backed vinyl upholstery is easy to clean and disinfect. With the high demand for good doctors and nurses these days, healthcare professionals can't afford to waste any time. With tool-free assembly, your medical stool will be ready to roll in no time. Durable Upholstery: Premium, stain-resistant, woven, knit-backed, vinyl upholstery available in a selection of hues. Comfortable Seat: Full-size diameter top with a 4"-thick seat facilitates comfortable positioning. Stable Design: A full-size diameter base with a 5-leg design promotes excellent stability. Sturdy Support: Seats have a 3/4"-thick solid plywood base. Smooth Rolling: Glides into position on dual-wheel nylon casters. Cost Effective: Knock-down design saves on shipping. No Hassle: Easy, no-tools-required assembly.